The AAP considers bug spray safe for use in children 2 months and older. Products that contain DEET (N,N-Diethyl-3-Methylbenzamide) are generally considered the most effective. Higher percentages of DEET our felt to last longer, but not be more effective. According to the AAP website products with 10% DEET should protect for about 2 hours, while products with 24% DEET should last 5 hours. 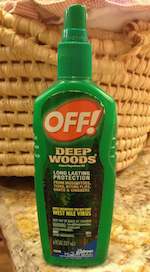 There is no benefit to using products that contain more than 30% DEET.